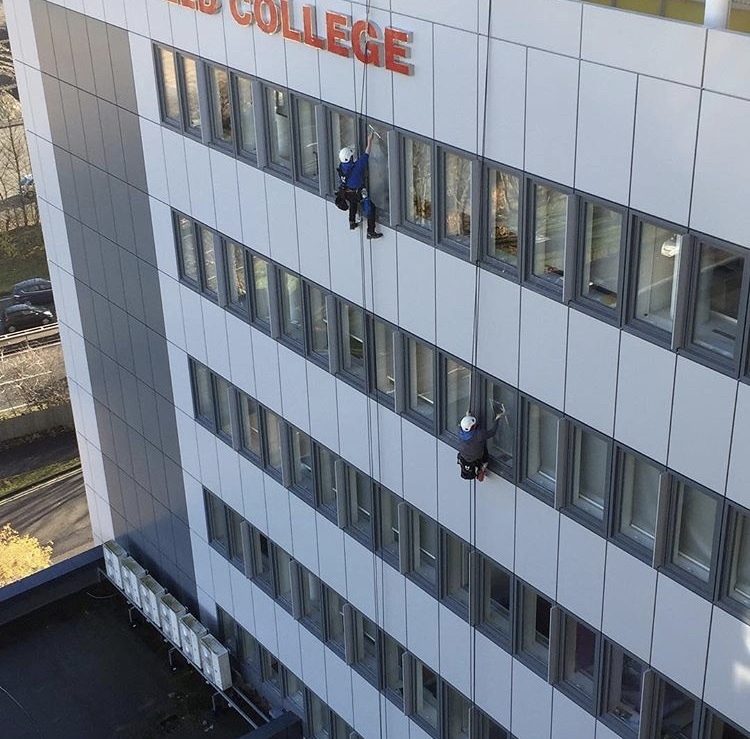 Our rope access and abseiling window cleaning expertise is second-to-none. Customers across Lancashire, Manchester, Liverpool, Leeds, Birmingham and everywhere in between, know they can trust Ultra Cleaning Service for their high-level window cleaning. The professional window cleaning team we have can scale all heights to get even the hardest to reach windows completely clean. Need help keeping your high-rise windows clean and clear from dirt? The experienced team here at Ultra Cleaning Service can provide bespoke rope access window cleaning solutions, tailored to suit your building. 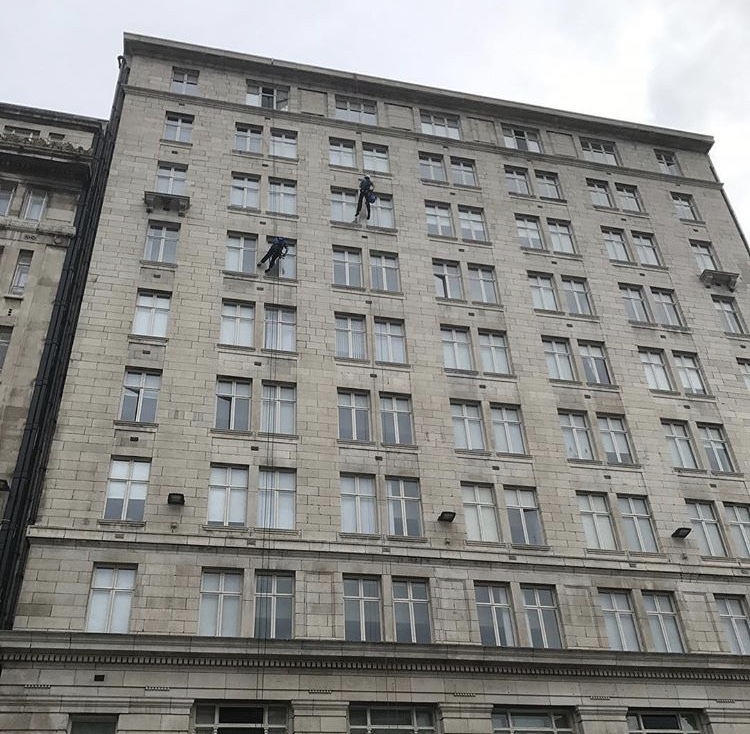 Whether it’s a high-rise office, apartments, tower blocks, educational facilities, retail sites or industrial units, we can provide fit for purpose abseiling window cleaning services. Our talented staff use the latest abseil equipment to ensure that they remain stable whilst up high. This means your windows will receive the best clean possible, no matter how high up they are. 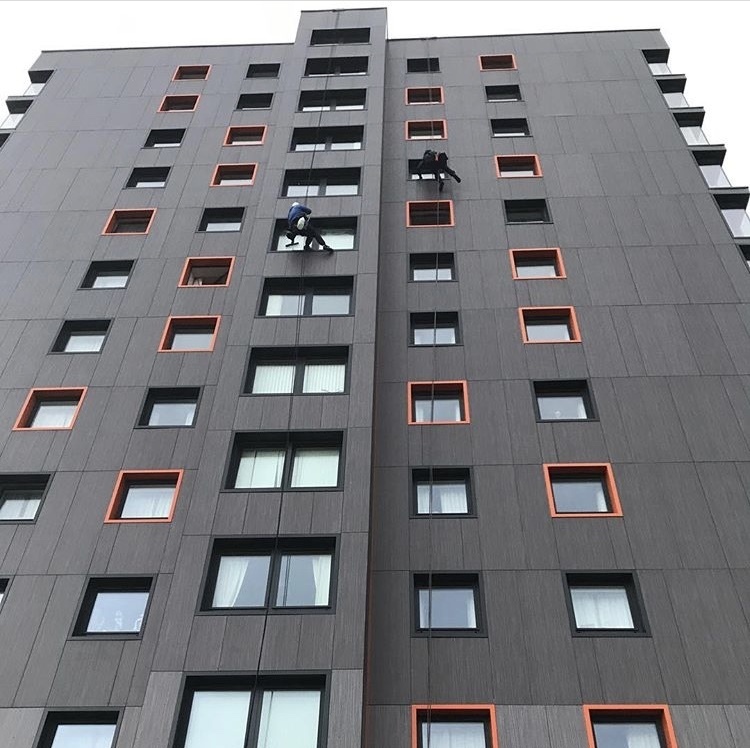 Using the latest abseiling window cleaning methods, we have a highly skilled team of professional window cleaners who enjoy the challenges that high-rise properties bring to their work. Our abseilers are also certified with both BS-7985 and IRATA. We can provide our rope access window cleaning solutions in a variety of formats including one-off cleans. Ultra Cleaning Service can also complete more regular window maintenance plans, including contracted cleaning schedules on a weekly, fortnightly, monthly and quarterly basis. As mentioned, our team of high rise window cleaners are fully trained on the equipment they use, including our abseilers and our powered access specialists. Individual and company-wide accreditations include IPAF (International Powered Access Federation), IOSH (Institution of Occupational Safety and Health), CHAS (The Contractors Health and Safety Assessment Scheme) Safe Contractor Approved and Rope and Abseil training (BS-7985 and IRATA). For added piece of mind, our staff are all CRB checked and Ultra Cleaning Service is fully insured so you can rest assured your staff and customers will remain safe whilst we’re completing our high level window cleaning. Worried that your roof isn’t kitted out for abseiling? Or perhaps the structure of your building hasn’t got the requirements needed to allow rope access? Don’t worry, Ultra Cleaning Service can still keep your difficult to reach windows clean. 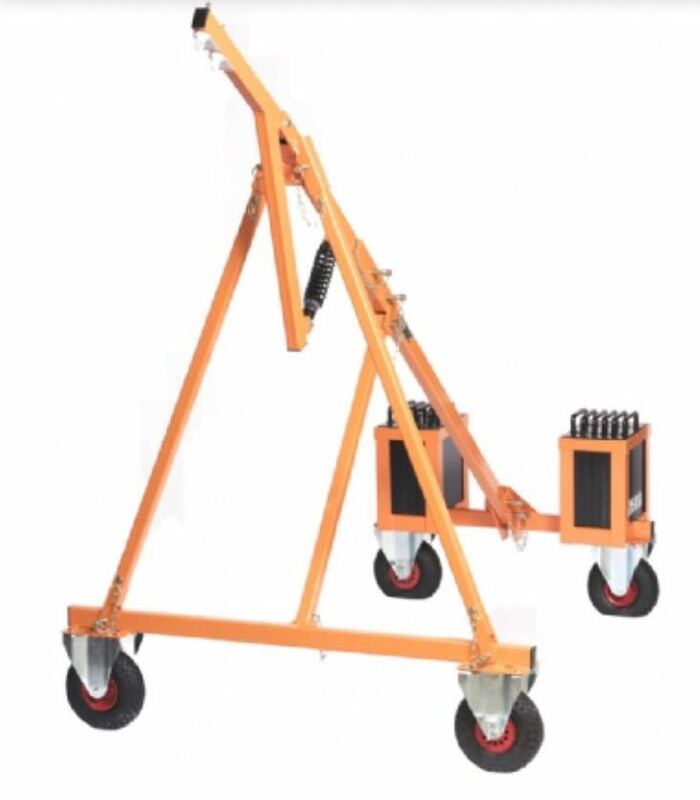 We have access to several mobile anchor systems; something a lot of our competitors don’t. By using mobile anchor points, our talented rope access window cleaners can make any building abseil friendly. 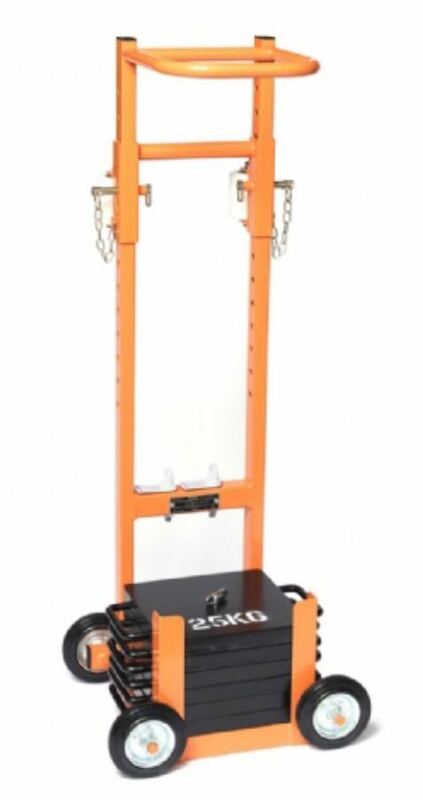 Contact the team today and we can tell you more about our mobile deadweight anchor machines. Being based in the heart of the North West, we’re perfectly positioned to help support businesses across Greater Manchester, Lancashire, Merseyside, Yorkshire, The Midlands and the wider UK. Our team of abseil and rope access window cleaners can scale all heights to give your windows the perfect clean. It’s not just the large cities where businesses can benefit from our cleaning support services though. We also love to help local firms across areas including Bolton, Blackburn, Bury, Preston, St Helens, Skelmersdale, Wigan, Blackpool, Huddersfield and many more too. No matter how tall your building is, our dedicated team of rope access window cleaners can help. Call us today to arrange a free consultation with a member of our team. Perhaps you need different window cleaning solutions such as powered access, reach and wash systems or lower level window cleaning services? If so, click here, to learn about our other window cleaning solutions. Contact a member of the Ultra Cleaning Service team today, for your totally FREE window cleaning consultation!